To begin a relationship, there are many things to consider about a potential partner, from age to personality, occupation and, for some, blood type. According to a survey conducted by Dooit Survey in January, the majority of 3,768 Koreans ranked personality as the priority when choosing a partner. Men ranked appearance and health as the second priority and occupation as third. Women put occupation and economic ability in the second spot, followed by appearance. The time-consuming process and limited pool of potential partners have been chronic challenges for those looking for a date. But these days, the endeavor may have gotten a little bit easier, or at least quicker, with the help of various mobile dating applications. “Previously, people had to go visit a matchmaker’s office to turn in their information, and pay a large sum in membership fees,” Lee Dong-ki, a manager at BNK Lab, told The Korea Herald. BNK Lab has since 2013 launched six dating apps to the Korean market, including Dangyeonsi, which has over 1.6 million registered members. “But on mobile apps, people can simply check each other’s profile at anytime, anywhere, which generally makes them feel less resistant toward looking for their partner. The younger generation seems to prefer this method much more,” Lee said. According to a 2017 report from Hongik University, South Korea’s online dating service industry is valued at 70 billion won ($66 million), with over 200 dating apps on the market. The popularity of such dating apps was apparent in market share. Last year, BNK Lab ranked fifth in the nongame app market here in terms of sales. Its rival Nextmatch, which operates Amanda, and Mozzet that runs Noon Date placed third and sixth, respectively. The top slot was taken by Kakao, operator of the nation’s most ubiquitous messenger service KakaoTalk. 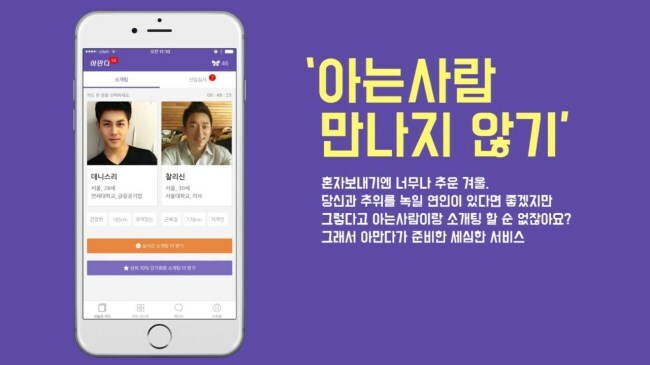 When using the Dangyeonsi app as a member, the registration process begins by typing in personal information including name, age, occupation, neighborhood and body type. One can also leave a note on his or her ideal type. 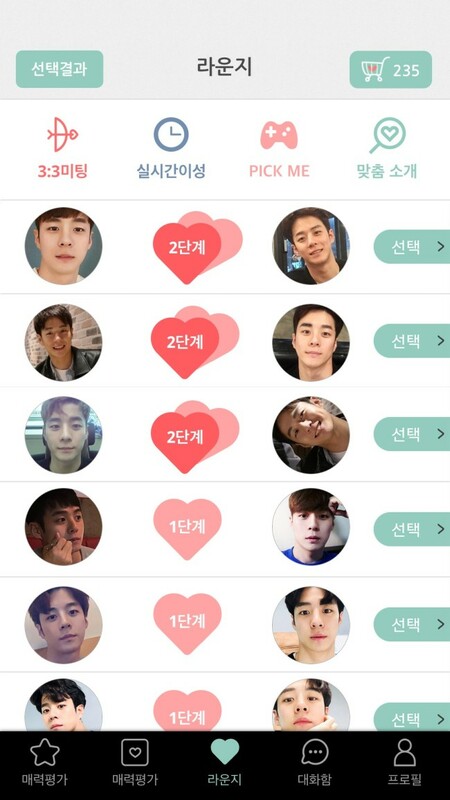 “We have this function similar to a tournament game, with which a user can pick their most ideal type among 16 candidates through a list of matches,” said Hwang Byung-oh, another manager at BNK Lab. Finding the ideal type and expressing favor by pressing the heart on another user’s profile are free, but if one wants to chat with, he or she needs to buy tickets on the app. Despite dating apps’ popularity, they have also been at the center of scrutiny for encouraging lookism, as well as their discriminatory nature and safety concerns. Sky People, for instance, only accepts male users who have attended certain prestigious universities, work for major conglomerates or are lawyers or doctors. But the same criteria does not apply to women, for whom the only qualification is they be aged between 20 and 43. Amanda imposes a somewhat dubious condition as well, requiring new applicants’ photos be rated by current users before they are accepted. “I feel it is strange to seek for relationships when you are not even sure what they (the other users) have posted is true or not,” said Kim Ju-yeong, who is in her 20s. Arguing that such perceptions demonstrate prejudices against their services, Hwang and Lee said their key tasks are to break such molds, particularly for a market like Korea, which is seen as more guarded. “Safety, credibility and quality of users are the top three criteria that South Koreans consider when picking a dating app. ... In the US, users on (top social search app) Tinder are generally those open to one-night stands, while users in Korea and Japan look down on such relations,” Hwang said. With business flourishing, Hwang said the next move will be creating more dating apps exclusively targeting certain groups, from divorced singles to 40- and 50-somethings.